Want to add your technique? Want to send a comment? Imrich, P.; Mueller, K.; Imre, D.; Zelenyuk, D. & Zhu, W.: Interactive Poster: 3D ThemeRiver. Poster Compendium of IEEE Symposium on Information Visualization (InfoVis), IEEE Computer Society, 2003. Imrich, P.; Mueller, K.; Imre, D.; Zelenyuk, D. & Zhu, W. (2003), © 2003 IEEE. Used with permission. Fry, B.: Organic Information Design. Masters Thesis, Massachusetts Institute of Technology, 2000. Image courtesy of Ben Fry, MIT Media Laboratory, Aesthetics + Computation Group, © 1999-2005. Wattenberg, M.: Arc Diagrams: Visualizing Structure in Strings. Proceedings of the IEEE Symposium on Information Visualization (InfoVis), IEEE Computer Society, 2002. Image courtesy of Michael Zornow. Adapted from Harris, R. L. (1999). Berry, L. & Munzner, T.: BinX: Dynamic Exploration of Time Series Datasets Across Aggregation Levels. Poster Compendium of IEEE Symposium on Information Visualization (InfoVis), IEEE Computer Society, 2004. Generated with the BinX tool with permission of Tamara Munzner. Javed, W.; McDonnel, B. & Elmqvist, N.: Graphical Perception of Multiple Time Series. IEEE Transactions on Visualization and Computer Graphics, Vol. 16, No. 6, 2010. Adapted from Javed, W.; McDonnel, B. & Elmqvist, N. (2010). © 2010 IEEE. Used with permission. Gschwandtner, T.; Aigner, W.; Kaiser, K.; Miksch, S. & Seyfang, A.: CareCruiser: Exploring and Visualizing Plans, Events, and Effects Interactively. Proceedings of the IEEE Pacific Visualization Symposium (PacificVis), IEEE Computer Society, 2011. Generated with the CareCruiser software. Zhao, J.; Chevalier, F.; Pietriga, E. & Balakrishnan, R.: Exploratory Analysis of Time-Series with ChronoLenses. IEEE Transactions on Visualization and Computer Graphics, Vol. 17, No. 12, 2011. Image courtesy of Jian Zhao. ChronoLenses is domain-independent time-series visualization technique supporting users in exploratory visual analysis tasks. Based on direct manipulation, ChronoLenses performs on-the-fly transformation of the data points in their focus area, tightly integrating visual analysis with interaction. Users can build pipelines composed of lenses performing various transformations on the data, effectively creating flexible and reusable time-series visual analysis interfaces. At any moment, users can change the parameters of already created lenses, with the modifications instantaneously propagating down through the pipeline, providing immediate visual feedback that supports the iterative exploration process. Keim, D. A.; Schneidewind, J. & Sips, M.: CircleView: A New Approach for Visualizing Time-Related Multidimensional Data Sets. Proceedings of the Working Conference on Advanced Visual Interfaces (AVI), ACM, 2004. Keim, D. A. & Schneidewind, J.: Scalable Visual Data Exploration of Large Data Sets via MultiResolution. Journal of Universal Computer Science, Vol. 11, No. 11, 2005. Adapted from Keim, D. A.; Schneidewind, J. & Sips, M. (2004). Brewer, C. A.: Color Use Guidelines for Data Representation. Proceedings of the Section on Statistical Graphics, American Statistical Association, 1999. Krzywinski, M.; Schein, J.; Birol, I.; Connors, J.; Gascoyne, R.; Horsman, D.; Jones, S. J. & Marra, M. A.: Circos: An Information Aesthetic for Comparative Genomics. Genome Research, Vol. 19, No. 9, 2009. Images courtesy of Martin Krzywinski. Chen, C.: CiteSpace II: Detecting and Visualizing Emerging Trends and Transient Patterns in Scientific Literature. Journal of the American Society for Information Science and Technology, Vol. 57, No. 3, 2006. Images courtesy of Chaomei Chen. Van Wijk, J. J. & Van Selow, E. R.: Cluster and Calendar Based Visualization of Time Series Data. Proceedings of the IEEE Symposium on Information Visualization (InfoVis), IEEE Computer Society, 1999. Van Wijk, J. J. & Van Selow, E. R. (1999), © 1999 IEEE. Used with permission. Andr\'e, P.; Wilson, M. L.; Russell, A.; Smith, D. A.; Owens, A. & schraefel, m.: Continuum: Designing Timelines for Hierarchies, Relationships and Scale. Proceedings of the ACM Symposium on User Interface Software and Technology (UIST), ACM, 2007. Image courtesy of Paul André. Adapted from Cleveland, W. (1993) with permission of William Cleveland. Ankerst, M.: Visual Data Mining with Pixel-oriented Visualization Techniques. Proceedings of the ACM SIGKDD Workshop on Visual Data Mining, ACM, 2001. Ankerst, M.; Kao, A.; Tjoelker, R. & Wang, C.: DataJewel: Integrating Visualization with Temporal Data Mining. In: Simoff, S., Böhlen, M. & Mazeika, A. (ed.) Visual Data Mining. Springer, 2008. Images courtesy of Mihael Ankerst. Thakur, S. & Rhyne, T.-M.: Data Vases: 2D and 3D Plots for Visualizing Multiple Time Series. Proceedings of the International Symposium on Visual Computing (ISVC), Springer, 2009. Thakur, S. & Hanson, A. J.: A 3D Visualization of Multiple Time Series on Maps. Proceedings of the International Conference Information Visualisation (IV), IEEE Computer Society, 2010. Thakur, S. & Hanson, A. J. (2010), © 2010 IEEE. Used with permission. Bederson, B. B.; Clamage, A.; Czerwinski, M. P. & Robertson, G. G.: DateLens: A Fisheye Calendar Interface for PDAs. ACM Transactions on Computer-Human Interaction, Vol. 11, No. 1, 2004. Images courtesy of Ben Bederson. Saito, T.; Miyamura, H.; Yamamoto, M.; Saito, H.; Hoshiya, Y. & Kaseda, T.: Two-Tone Pseudo Coloring: Compact Visualization for One-Dimensional Data. Proceedings of the IEEE Symposium on Information Visualization (InfoVis), IEEE Computer Society, 2005. Tominski, C. & Schumann, H.: Enhanced Interactive Spiral Display. Proceedings of the Annual SIGRAD Conference, Special Theme: Interactivity, Linköping University Electronic Press, 2008. Generated with the enhanced interactive spiral display tool. Luo, D.; Yang, J.; Krstajic, M.; Ribarsky, W. & Keim, D.: EventRiver: Visually Exploring Text Collections With Temporal References. IEEE Transactions on Visualization and Computer Graphics, Vol. 12, No. 1, 2012. Luo, D.; Yang, J.; Krstajic, M.; Ribarsky, W. & Keim, D. (2012). © 2011, IEEE. Used with permission. Beard, K.; Deese, H. & Pettigrew, N. R.: A Framework for Visualization and Exploration of Events. Information Visualization, Vol. 7, No. 2, 2008. Adapted from Beard, K.; Deese, H. & Pettigrew, N. R. (2008). Dachselt, R. & Weiland, M.: TimeZoom: A Flexible Detail and Context Timeline. Proceedings of the SIGCHI Conference on Human Factors in Computing Systems (CHI), ACM, 2006. Dachselt, R.; Frisch, M. & Weiland, M.: FacetZoom: A Continuous Multi-Scale Widget for Navigating Hierarchical Metadata. Proceedings of the SIGCHI Conference on Human Factors in Computing Systems (CHI), ACM, 2008. Image courtesy of Raimund Dachselt. Vande Moere, A.: Time-Varying Data Visualization Using Information Flocking Boids. Proceedings of the IEEE Symposium on Information Visualization (InfoVis), IEEE Computer Society, 2004. Vande Moere, A. (2004), © 2004 IEEE. Used with permission. Andrienko, N. & Andrienko, G.: Spatial Generalization and Aggregation of Massive Movement Data. IEEE Transactions on Visualization and Computer Graphics, Vol. 17, No. 2, 2011. Image courtesy of Gennady Andrienko. Boyandin, I.; Bertini, E.; Bak, P. & Lalanne, D.: Flowstrates: An Approach for Visual Exploration of Temporal Origin-Destination Data. Computer Graphics Forum, Vol. 30, No. 3, 2011. Image courtesy of Ilya Boyandin. Flowstrates by Boyandin, I.; Bertini, E.; Bak, P. & Lalanne, D. (2011) extend the idea of flow maps (see Flow Map) to the temporal dimension and allow the user to analyze changes of the flow magnitudes over time. In Flowstrates the origins and the destinations of the flows are displayed in two separate maps, and the temporal changes of the flow magnitudes are displayed between the two maps in a heatmap in which the columns represent time periods. As in most flow maps that focus on representing the flow magnitudes, the exact routes of the flows are not accurately represented in Flowstrates. Instead, the flow lines are rerouted so that they connect the flow origins and destinations with the corresponding rows of the heatmap, as if the flows were going through it. The flow lines help to see in the geographic maps the origin and the destination corresponding to each of the heatmap rows. To allow the user to explore the whole data in every bit of detail, Flowstrates provide interactive support for performing spatial visual queries, focusing on different regions of interest for the origins and destinations, zooming and panning, sorting and aggregating the heatmap rows. Gantt, H. L.: Work, Wages, and Profits. Engineering Magazine Co., 1913. Kapler, T. & Wright, W.: GeoTime Information Visualization. Information Visualization, Vol. 4, No. 2, 2005. Eccles, R.; Kapler, T.; Harper, R. & Wright, W.: Stories in GeoTime. Information Visualization, Vol. 7, No. 1, 2008. Kapler, T.; Eccles, R.; Harper, R. & Wright, W.: Configurable Spaces: Temporal Analysis in Diagrammatic Contexts. Proceedings of the IEEE Symposium on Visual Analytics Science and Technology (VAST), IEEE Computer Society, 2008. Image courtesy of William Wright. GeoTime is a registered trademark of Oculus Info Inc.
Hinum, K.; Miksch, S.; Aigner, W.; Ohmann, S.; Popow, C.; Pohl, M. & Rester, M.: Gravi++: Interactive Information Visualization to Explore Highly Structured Temporal Data. Journal of Universal Computer Science, Vol. 11, No. 11, 2005. Image courtesy of Klaus Hinum. Tominski, C. & Schulz, H.-J. : The Great Wall of Space-Time. Proceedings of the Workshop on Vision, Modeling & Visualization (VMV), Magdeburg, Germany, Eurographics Association, 2012. Image courtesy of Christian Tominski. Tominski, C. & Schulz, H.-J. (2012) introduce a visualization technique for spatio-temporal data that refers to 2D geographical space and 1D linear time. The idea is to construct a non-planar slice -- called the Great Wall of Space-Time -- through the 3D (2D+1D) space-time continuum. The construction of the wall is based on topological and geometrical aspects of the geographical space. Based on a neighborhood graph, a topological path is established automatically or interactively. The topological path is transformed to a geometrical path that respects the geographic properties of the areas of the map. The geometrical path is extruded to a 3D wall, whose 3rd dimension can be used to map the time domain. Different visual representations can be projected onto the wall in order to display the data. Examples illustrate data visualizations based on color-coding and parallel coordinates. The wall has the advantage that it shows a closed path through space with no gaps between the information-bearing pixels on the screen. Lammarsch, T.; Aigner, W.; Bertone, A.; Gärtner, J.; Mayr, E.; Miksch, S. & Smuc, M.: Hierarchical Temporal Patterns and Interactive Aggregated Views for Pixel-based Visualizations. Proceedings of the International Conference Information Visualisation (IV), IEEE Computer Society, 2009. Generated with the GROOVE software. Bak, P.; Mansmann, F.; Janetzko, H. & Keim, D. A.: Spatiotemporal Analysis of Sensor Logs using Growth Ring Maps. IEEE Transactions on Visualization and Computer Graphics, Vol. 15, No. 6, 2009. Andrienko, G. L.; Andrienko, N. V.; Bak, P.; Keim, D. A.; Kisilevich, S. & Wrobel, S.: A Conceptual Framework and Taxonomy of Techniques for Analyzing Movement. Journal of Visual Languages & Computing, Vol. 22, No. 3, 2011. Image courtesy of Peter Bak. Growth Ring Maps is a technique for visualizing the spatio-temporal distribution of events. Every spatio-temporal event is represented by one pixel, which makes the technique highly scalable with the number of events. Each location (for example the centroid of spatial clusters of events) is taken as the center point for the computation of growth rings. The pixels (i.e., events) are placed around this center point in an orbital manner resulting in so called Growth Ring representations. The pixels are sorted by the date and time the event occurred: the earlier an event happened, the closer is the pixel to the central point. When two or more neighboring growth rings are about to overlap, the layout algorithm displaces the pixels in such a way that none of them is covered by another pixel. Hence, when big clusters of events are close in space, the corresponding growth rings will not have perfectly circular shapes but will be distorted. The resulting Growth Ring Maps are overlaid over a cartographic map to capture their spatial context. The figure illustrates Growth Ring Maps where events correspond to photos taken by tourists. Tominski, C.; Schulze-Wollgast, P. & Schumann, H.: 3D Information Visualization for Time Dependent Data on Maps. Proceedings of the International Conference Information Visualisation (IV), IEEE Computer Society, 2005. Generated with the LandVis system. Vi\'egas, F. B.; Wattenberg, M. & Dave, K.: Studying Cooperation and Conflict between Authors with history flow Visualizations. Proceedings of the SIGCHI Conference on Human Factors in Computing Systems (CHI), ACM, 2004. Images courtesy of Fernanda B. Viégas. Reijner, H.: The Development of the Horizon Graph. Electronic Proceedings of the VisWeek Workshop From Theory to Practice: Design, Vision and Visualization, 2008. Heer, J.; Kong, N. & Agrawala, M.: Sizing the Horizon: The Effects of Chart Size and Layering on the Graphical Perception of Time Series Visualizations. Proceedings of the SIGCHI Conference on Human Factors in Computing Systems (CHI), ACM, 2009. Left: Adapted from Reijner, H. (2008). Right: Image courtesy of Hannes Reijner. Tominski, C.; Schulze-Wollgast, P. & Schumann, H.: Visualisierung zeitlicher Verläufe auf geografischen Karten. In: Kartographische Schriften, Band 7: Visualisierung und Erschließung von Geodaten. Kirschbaum Verlag, 2003. Fuchs, G. & Schumann, H.: Visualizing Abstract Data on Maps. Proceedings of the International Conference Information Visualisation (IV), IEEE Computer Society, 2004. Chuah, M. C. & Eick, S. G.: Information Rich Glyphs for Software Management Data. IEEE Computer Graphics and Applications, Vol. 18, No. 4, 1998. Chuah, M. C. & Eick, S. G. (1998), © 1998 IEEE. Used with permission. Chittaro, L.; Combi, C. & Trapasso, G.: Data Mining on Temporal Data: A Visual Approach and its Clinical Application to Hemodialysis. Journal of Visual Languages and Computing, Vol. 14, No. 6, 2003. Chittaro, L.; Combi, C. & Trapasso, G. (2003), © 2003 Elsevier. Used with permission. Muniandy, K.: Visualizing Time-Related Events for Intrusion Detection. Late Breaking Hot Topics of the IEEE Symposium on Information Visualization (InfoVis), IEEE Computer Society, 2001. Images courtesy of Kovalan Muniandy. Erbacher, R. F.; Walker, K. L. & Frincke, D. A.: Intrusion and Misuse Detection in Large-Scale Systems. IEEE Computer Graphics and Applications, Vol. 22, No. 1, 2002. Image courtesy of Robert F. Erbacher. Bale, K.; Chapman, P.; Purdy, J.; Aydin, N. & Dark, P.: Kaleidomap Visualizations of Cardiovascular Function in Critical Care Medicine. Proceedings of the International Conference on Medical Information Visualisation - BioMedical Visualisation (MediVis), IEEE Computer Society, 2006. Bale, K.; Chapman, P.; Barraclough, N.; Purdy, J.; Aydin, N. & Dark, P.: Kaleidomaps: A New Technique for the Visualization of Multivariate Time-Series Data. Information Visualization, Vol. 6, No. 2, 2007. Bale, K.; Chapman, P.; Purdy, J.; Aydin, N. & Dark, P. (2006), © 2006 IEEE. Used with permission. Kolence, K. W. & Kiviat, P. J.: Software Unit Profiles & Kiviat Figures. SIGMETRICS Performance Evaluation Review, Vol. 2, No. 3, 1973. Tominski, C.; Abello, J. & Schumann, H.: Interactive Poster: 3D Axes-Based Visualizations for Time Series Data. Poster Compendium of IEEE Symposium on Information Visualization (InfoVis), IEEE Computer Society, 2005. Shahar, Y.; Goren-Bar, D.; Boaz, D. & Tahan, G.: Distributed, Intelligent, Interactive Visualization and Exploration of Time-Oriented Clinical Data and their Abstractions. Artificial Intelligence in Medicine, Vol. 38, No. 2, 2006. Shahar, Y.; Goren-Bar, D.; Boaz, D. & Tahan, G. (2006), © 2006 Elsevier. Used with permission. Zhao, J.; Chevalier, F. & Balakrishnan, R.: KronoMiner: Using Multi-Foci Navigation for the Visual Exploration of Time-Series Data. Proceedings of the SIGCHI Conference on Human Factors in Computing Systems (CHI), ACM, 2011. KronoMiner is a multipurpose time-series exploration tool providing rich navigation capabilities and analytical support. Its visualization is based on a hierarchical radial layout, allowing users to drill into details by focusing on different pieces. The data pieces can be rotated, dragged, stretched or shrunken in a facile manner, supporting various kinds of time-series analysis and exploration tasks. KronoMiner also introduces two analytical techniques: 1) MagicAnalytics Lens which shows the correlations between two parts of the data pieces when overlapped and 2) Best Match mode in which an arch shape is displayed indicating the matching parts of two data pieces under a specific similarity measure. Plaisant, C.; Mushlin, R.; Snyder, A.; Li, J.; Heller, D. & Shneiderman, B.: LifeLines: Using Visualization to Enhance Navigation and Analysis of Patient Records. Proceedings of the American Medical Informatics Association Annual Fall Symposium, American Medical Informatic Association (AMIA), 1998. Image courtesy of Catherine Plaisant and University of Maryland Human-Computer Interaction Lab. Wang, T. D.; Plaisant, C.; Shneiderman, B.; Spring, N.; Roseman, D.; Marchand, G.; Mukherjee, V. & Smith, M.: Temporal Summaries: Supporting Temporal Categorical Searching, Aggregation and Comparison. IEEE Transactions on Visualization and Computer Graphics, Vol. 15, 2009. Image courtesy of Taowei David Wang. McLachlan, P.; Munzner, T.; Koutsofios, E. & North, S.: LiveRAC: Interactive Visual Exploration of System Management Time-Series Data. Proceedings of the SIGCHI Conference on Human Factors in Computing Systems (CHI), ACM, 2008. McLachlan, P.; Munzner, T.; Koutsofios, E. & North, S. (2008), © 2008 ACM. Used with permission. 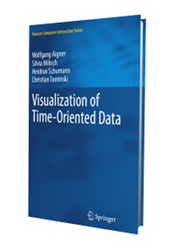 Bade, R.; Schlechtweg, S. & Miksch, S.: Connecting Time-oriented Data and Information to a Coherent Interactive Visualization. Proceedings of the SIGCHI Conference on Human Factors in Computing Systems (CHI), ACM, 2004. Unger, A. & Schumann, H.: Visual Support for the Understanding of Simulation Processes. Proceedings of the IEEE Pacific Visualization Symposium (PacificVis), IEEE Computer Society, 2009. Image courtesy of Andrea Unger. Shimabukuro, M.; Flores, E.; de Oliveira, M. & Levkowitz, H.: Coordinated Views to Assist Exploration of Spatio-Temporal Data: A Case Study. Proceedings of the International Conference on Coordinated and Multiple Views in Exploratory Visualization (CMV), IEEE Computer Society, 2004. Image courtesy of Milton Hirokazu Shimabukuro. Hao, M. C.; Dayal, U.; Keim, D. A. & Schreck, T.: Importance-Driven Visualization Layouts for Large Time Series Data. Proceedings of the IEEE Symposium on Information Visualization (InfoVis), IEEE Computer Society, 2005. Hao, M.; Dayal, U.; Keim, D. & Schreck, T.: Multi-Resolution Techniques for Visual Exploration of Large Time-Series Data. Proceedings of the Joint Eurographics - IEEE TCVG Symposium on Visualization (VisSym), The Eurographics Association, 2007. Image courtesy of Tobias Schreck. Hao, M.; Dayal, U.; Keim, D. & Schreck, T. (2007) address the problem of visualizing large time series with many time points. Extending earlier work on importance-driven layouts of time series (see Hao, M. C.; Dayal, U.; Keim, D. A. & Schreck, T. (2005)), the authors propose a degree-of-interest (DOI) approach to generate a multi-resolution visualization. Data with low DOI will be represented at lower resolution, whereas interesting data with high DOI will be shown at higher resolution. In this way, less-relevant data take up less display space and relevant data will be assigned more display space. This makes it easier for the user to analyze the relevant parts in more detail. While the authors propose a matrix-like color-based visualization, the multi-resolution approach is generally applicable to other kinds of visual representations of time-oriented data as well. Tominski, C.; Abello, J. & Schumann, H.: Axes-Based Visualizations with Radial Layouts. Proceedings of the ACM Symposium on Applied Computing (SAC), ACM, 2004. Generated with the VisAxes software. Chittaro, L. & Combi, C.: Visualizing Queries on Databases of Temporal Histories: New Metaphors and their Evaluation. Data and Knowledge Engineering, Vol. 44, No. 2, 2003. Image courtesy of Luca Chittaro. Fanea, E.; Carpendale, M. S. T. & Isenberg, T.: An Interactive 3D Integration of Parallel Coordinates and Star Glyphs. Proceedings of the IEEE Symposium on Information Visualization (InfoVis), IEEE Computer Society, 2005. Fanea, E.; Carpendale, M. S. T. & Isenberg, T. (2005), © 2005 IEEE. Used with permission. Fails, J.; Karlson, A.; Shahamat, L. & Shneiderman, B.: A Visual Interface for Multivariate Temporal Data: Finding Patterns of Events across Multiple Histories. Proceedings of the IEEE Symposium on Visual Analytics Science and Technology (VAST), IEEE Computer Society, 2006. Image courtesy of Jerry Alan Fails. Xiong, R. & Donath, J.: PeopleGarden: Creating Data Portraits for Users. Proceedings of the ACM Symposium on User Interface Software and Technology (UIST), ACM, 1999. Xiong, R. & Donath, J. (1999), © 1999 ACM. Used with permission. Mackinlay, J. D.; Robertson, G. G. & Card, S. K.: The Perspective Wall: Detail and Context Smoothly Integrated. Proceedings of the SIGCHI Conference on Human Factors in Computing Systems (CHI), ACM, 1991. Stein, K.; Wegener, R. & Schlieder, C.: Pixel-Oriented Visualization of Change in Social Networks. Proceedings of the International Conference on Advances in Social Networks Analysis and Mining (ASONAM), IEEE Computer Society, 2010. Images courtesy of Klaus Stein. Aigner, W.; Miksch, S.; Thurnher, B. & Biffl, S.: PlanningLines: Novel Glyphs for Representing Temporal Uncertainties and their Evaluation. Proceedings of the International Conference Information Visualisation (IV), IEEE Computer Society, 2005. Adapted from Aigner, W.; Miksch, S.; Thurnher, B. & Biffl, S. (2005). Vi\'egas, F.; Boyd, D.; Nguyen, D.; Potter, J. & Donath, J.: Digital Artifacts for Remembering and Storytelling: PostHistory and Social Network Fragments. Proceedings of the Annual Hawaii International Conference on System Sciences (HICSS), IEEE Computer Society, 2004. Image courtesy of Fernanda B. Viégas. Matkovi\'c, K.; Hauser, H.; Sainitzer, R. & Gröller, E.: Process Visualization with Levels of Detail. Proceedings of the IEEE Symposium on Information Visualization (InfoVis), IEEE Computer Society, 2002. Matković, K.; Hauser, H.; Sainitzer, R. & Gröller, E. (2002), © 2002 IEEE. Used with permission. Keim, D.; Kriegel, H.-P. & Ankerst, M.: Recursive Pattern: A Technique for Visualizing Very Large Amounts of Data. Proceedings of IEEE Visualization (Vis), IEEE Computer Society, 1995. Keim, D.; Kriegel, H.-P. & Ankerst, M. (1995), © 1995 IEEE. Used with permission. Zhao, J.; Forer, P. & Harvey, A. S.: Activities, Ringmaps and Geovisualization of Large Human Movement Fields. Information Visualization, Vol. 7, No. 3, 2008. Huang, G.; Govoni, S.; Choi, J.; Hartley, D. M. & Wilson, J. M.: Geovisualizing Data With Ring Maps. ArcUser, Vol. Winter 2008, 2008. Left: Image courtesy of Guilan Huang. Right: Image courtesy of Jinfeng Zhao. Wongsuphasawat, K. & Shneiderman, B.: Finding Comparable Temporal Categorical Records: A Similarity Measure with an Interactive Visualization. Proceedings of the IEEE Symposium on Visual Analytics Science and Technology (VAST), IEEE Computer Society, 2009. Image courtesy of Krist Wongsuphasawat. Generated with the JFlowMap software with permission of Ilya Boyandin. Gall, H.; Jazayeri, M. & Riva, C.: Visualizing Software Release Histories: The Use of Color and Third Dimension. Proceedings of the International Conference on Software Maintenance (ICSM), IEEE Computer Society, 1999. Gall, H.; Jazayeri, M. & Riva, C. (1999), © 1999 IEEE. Used with permission. Chuah, M. C.: Dynamic Aggregation with Circular Visual Designs. Proceedings of the IEEE Symposium on Information Visualization (InfoVis), IEEE Computer Society, 1998. Chuah, M. C. (1998), © 1998 IEEE. Used with permission. Rit, J.-F.: Propagating Temporal Constraints for Scheduling. Proceedings of the National Conference on Artificial Intelligence (AAAI), Morgan Kaufmann, 1986. Kosara, R. & Miksch, S.: Visualization Methods for Data Analysis and Planning. International Journal of Medical Informatics, Vol. 68, No. 1--3, 2002. Images courtesy of Robert Kosara. Hägerstrand, T.: What About People in Regional Science?. Papers of the Regional Science Association, Vol. 24, 1970. Kraak, M.-J. : The Space-Time Cube Revisited from a Geovisualization Perspective. Proceedings of the 21st International Cartographic Conference (ICC), The International Cartographic Association (ICA), 2003. Image courtesy of Thomas Nocke. Lenntorp, B.: Paths in Space-Time Environments: A Time Geographic Study of Movement Possibilities of Individuals. In: Lund Studies in Geography. Royal University of Lund, 1976. Kwan, M.-P.: Space-Time Paths. In: Madden, M. (ed.) Manual of Geographic Information Systems. American Society for Photogrammetry and Remote Sensing, 2009. Kraak, M.-J. (2003), © 2003 International Cartographic Association (ICA). Used with permission. Lee, B.; Riche, N.; Karlson, A. & Carpendale, S.: SparkClouds: Visualizing Trends in Tag Clouds. IEEE Transactions on Visualization and Computer Graphics, Vol. 16, No. 6, 2010. Lee, B.; Riche, N.; Karlson, A. & Carpendale, S. (2010). © 2010, IEEE. Used with permission. Generated with the sparklines package for LaTeX. Gatalsky, P.; Andrienko, N. & Andrienko, G.: Interactive Analysis of Event Data Using Space-Time Cube. Proceedings of the International Conference Information Visualisation (IV), IEEE Computer Society, 2004. Turdukulov, U. D.; Kraak, M.-J. & Blok, C. A.: Designing a Visual Environment for Exploration of Time Series of Remote Sensing Data: In Search for Convective Clouds. Computers & Graphics, Vol. 31, No. 3, 2007. Left: Turdukulov, U. D.; Kraak, M.-J. & Blok, C. A. (2007), © 2007 Elsevier. Used with permission. Center: Generated with the LandVis system. Right: Gatalsky, P.; Andrienko, N. & Andrienko, G. (2004), © 2004 IEEE. Used with permission. Dragicevic, P. & Huot, S.: SpiraClock: A Continuous and Non-Intrusive Display for Upcoming Events. Proceedings of the SIGCHI Conference on Human Factors in Computing Systems (CHI), ACM, 2002. Adapted from Dragicevic, P. & Huot, S. (2002) with permission of Pierre Dragicevic. Carlis, J. V. & Konstan, J. A.: Interactive Visualization of Serial Periodic Data. Proceedings of the ACM Symposium on User Interface Software and Technology (UIST), ACM, 1998. Carlis, J. V. & Konstan, J. A. (1998), © 1998 ACM. Used with permission. Weber, M.; Alexa, M. & Müller, W.: Visualizing Time-Series on Spirals. Proceedings of the IEEE Symposium on Information Visualization (InfoVis), IEEE Computer Society, 2001. Weber, M.; Alexa, M. & Müller, W. (2001), © 2001 IEEE. Used with permission. Byron, L. & Wattenberg, M.: Stacked Graphs &#x2013; Geometry & Aesthetics. IEEE Transactions on Visualization and Computer Graphics, Vol. 14, No. 6, 2008. Generated with the streamgraph_generator code base. Carvalho, A.; Augusto de, A. S.; Ribeiro, C. & Costa, E.: A Temporal Focus + Context Visualization Model for Handling Valid-Time Spatial Information. Information Visualization, Vol. 7, No. 3-4, 2008. Image courtesy of Alexandre Carvalho. Carvalho, A.; Augusto de, A. S.; Ribeiro, C. & Costa, E. (2008) introduce a temporal focus+context visualization model to meaningfully display several time instants simultaneously. In this model, focus+context is applied to time rather than, as more typically, to attributes or space. Underlying the proposed technique is the calculation of a temporal degree of interest (TDOI), which is driven by the valid time attribute, by specific analysis, exploration, or presentation goals as well as by user-defined visualization requirements. The TDOI is used to convey the temporal aspects of the data via adjusting graphical properties, such as transparency, color, sketchiness, or other non-photorealistic enhancements. This makes it possible to meaningfully compress information about distinct temporal states of the data into the same visualization display. Luz, S. & Masoodian, M.: A mobile system for non-linear access to time-based data. Proceedings of the Working Conference on Advanced Visual Interfaces (AVI), ACM, 2004. Luz, S. & Masoodian, M.: Visualisation of Parallel Data Streams with Temporal Mosaics. Proceedings of the International Conference Information Visualisation (IV), IEEE Computer Society, 2007. Luz, S. & Masoodian, M.: Improving Focus and Context Awareness in Interactive Visualization of Time Lines. Proceedings of the British Computer Society Conference on Human-Computer Interaction (BCS-HCI), ACM, 2010. Image courtesy of Saturnino Luz. Temporal mosaic is a technique for visualization of parallel time-based streams. It provides a compact way of representing concurrent events by allocating a fixed drawing area to time intervals and partitioning that area according to the number of events that co-occur in that time interval. The figure shows a temporal mosaic representation of a house renovation schedule with hierarchical event dependencies. Time is mapped along the horizontal axis. Differently colored regions in the mosaic indicate at which time a particular renovation is scheduled. One can see that some renovations can be executed in parallel, while others depend on each other an need be carried out one after the other. The temporal mosaic technique has also been evaluated in the context of meeting browsing tasks. Noirhomme-Fraiture, M.: Visualization of Large Data Sets: The Zoom Star Solution. Journal of Symbolic Data Analysis, Vol. 0, No. 0, 2002. Images courtesy of Monique Noirhomme. Havre, S.; Hetzler, E. & Nowell, L.: ThemeRiver: Visualizing Theme Changes Over Time. Proceedings of the IEEE Symposium on Information Visualization (InfoVis), IEEE Computer Society, 2000. Havre, S.; Hetzler, E.; Whitney, P. & Nowell, L.: ThemeRiver: Visualizing Thematic Changes in Large Document Collections. IEEE Transactions on Visualization and Computer Graphics, Vol. 8, No. 1, 2002. Havre, S.; Hetzler, E.; Whitney, P. & Nowell, L. (2002), © 2002 IEEE. Used with permission. Mintz, D.; Fitz-Simons, T. & Wayland, M.: Tracking Air Quality Trends with SAS/GRAPH. Proceedings of the 22nd Annual SAS User Group International Conference (SUGI), SAS, 1997. Adapted from Mintz, D.; Fitz-Simons, T. & Wayland, M. (1997) with permission of David Mintz. Kosara, R. & Miksch, S.: Metaphors of Movement - A Visualization and User Interface for Time-Oriented, Skeletal Plans. Artificial Intelligence in Medicine, Vol. 22, No. 2, 2001. Bach, B.; Shi, C.; Heulot, N.; Madhyastha, T.; Grabowski, T. & Dragicevic, P.: Time Curves: Folding Time to Visualize Patterns of Temporal Evolution in Data. IEEE Transactions on Visualization and Computer Graphics, Vol. 22, No. 1, 2016. Image generated with Time Curves software by Benjamin Bach. Bach, B.; Shi, C.; Heulot, N.; Madhyastha, T.; Grabowski, T. & Dragicevic, P. (2016) describe a technique called Time Curves. The metaphor behind this technique is to fold a line plot visualization into itself so as to bring similar time points close to each other. This metaphor can be applied to any dataset where a similarity metric between time points can be defined. Technically, each time point is assigned a two-dimensional position based on the similarity metric. Then successive time points are connected by a curve so as to visualize their temporal order. Time curves are a general approach to visualize patterns of evolution in temporal data, such as progression and stagnation, sudden changes, regularity and irregularity, reversals to previous states, temporal states and transitions, reversals to previous states, and others. Cousins, S. B. & Kahn, M. G.: The Visual Display of Temporal Information. Artificial Intelligence in Medicine, Vol. 3, No. 6, 1991. Cousins, S. B. & Kahn, M. G. (1991), © 1991 Elsevier. Used with permission. Watson, M. C.: Time Maps: A Tool for Visualizing Many Discrete Events Across Multiple Timescales. Proceedings of the IEEE International Conference on Big Data (Big Data), IEEE Computer Society, 2015. Image courtesy of Max C. Watson. Watson, M. C. (2015) proposes Time Maps to visualize discrete event data. A Time Map is basically a scatter plot, where each point corresponds to an event. Time Maps are special in that an event's x-coordinate is the time between the event itself and the preceding event. The y-coordinate is the time between the event itself and the subsequent event. Plotted this way, time maps allow the viewer to identify critical features, whether they occur on a timescale of milliseconds or months. Each point in the scatter plot can also be colored to encode additional information, such as the time of day. Shanbhag, P.; Rheingans, P. & desJardins, M.: Temporal Visualization of Planning Polygons for Effcient Partitioning of Geo-Spatial Data. Proceedings of the IEEE Symposium on Information Visualization (InfoVis), IEEE Computer Society, 2005. Shanbhag, P.; Rheingans, P. & desJardins, M. (2005), © 2005 IEEE. Used with permission. Akaishi, M. & Okada, Y.: Time-tunnel: Visual Analysis Tool for Time-series Numerical Data and its Aspects as Multimedia Presentation Tool. Proceedings of the International Conference Information Visualisation (IV), IEEE Computer Society, 2004. Akaishi, M. & Okada, Y. (2004), © 2004 IEEE. Used with permission. Hadlak, S.; Tominski, C.; Schulz, H.-J. & Schumann, H.: Visualization of Attributed Hierarchical Structures in a Spatio-Temporal Context. International Journal of Geographical Information Science, Vol. 24, No. 10, 2010. Rohrdantz, C.; Hao, M. C.; Dayal, U.; Haug, L.-E. & Keim, D. A.: Feature-Based Visual Sentiment Analysis of Text Document Streams. ACM Transactions on Intelligent Systems and Technology, Vol. 3, No. 2, 2012. Image courtesy of Christian Rohrdantz. In the context of text stream visualization Rohrdantz, C.; Hao, M. C.; Dayal, U.; Haug, L.-E. & Keim, D. A. (2012) developed a technique called TimeDensityPlots. It is an instant based 2D visualization, where the data items (here documents) are arranged in the sequence of their appearance. The idea is that each data item gets a visual data representation (i.e., a bar) that is clickable for further exploration and to avoid overlap or empty space along the timeline. The information about exact temporal relations is given as a curve below the bars that represent the data items. The higher the curve below the border of two items the closer they are in time. Kosara, R.; Bendix, F. & Hauser, H.: TimeHistograms for Large, Time-Dependent Data. Proceedings of the Joint Eurographics - IEEE TCVG Symposium on Visualization (VisSym), IEEE Computer Society, 2004. Kosara, R.; Bendix, F. & Hauser, H. (2004), © 2004 IEEE. Used with permission. Burch, M.; Beck, F. & Diehl, S.: Timeline Trees: Visualizing Sequences of Transactions in Information Hierarchies. Proceedings of the Working Conference on Advanced Visual Interfaces (AVI), ACM, 2008. Image courtesy of Michael Burch. Kim, N. W.; Card, S. K. & Heer, J.: Tracing Genealogical Data with TimeNets. Proceedings of the International Working Conference on Advanced Visual Interfaces (AVI), ACM, 2010. Image courtesy of Jeffrey Heer and Nam Wook Kim. Rind, A.; Aigner, W.; Miksch, S.; Wiltner, S.; Pohl, M.; Drexler, F.; Neubauer, B. & Suchy, N.: Visually Exploring Multivariate Trends in Patient Cohorts Using Animated Scatter Plots. In: Robertson, M. (ed.) Ergonomics and Health Aspects of Work with Computers. Springer, 2011. Generated with the TimeRider software. Hochheiser, H. & Shneiderman, B.: Dynamic Query Tools for Time Series Data Sets: Timebox Widgets for Interactive Exploration. Information Visualization, Vol. 3, No. 1, 2004. Buono, P.; Aris, A.; Plaisant, C.; Khella, A. & Shneiderman, B.: Interactive Pattern Search in Time Series. Proceedings of the Conference on Visualization and Data Analysis (VDA), SPIE, 2005. Generated with the TimeSearcher software with permission of University of Maryland Human-Computer Interaction Lab. Buono, P.; Plaisant, C.; Simeone, A.; Aris, A.; Shneiderman, B.; Shmueli, G. & Jank, W.: Similarity-Based Forecasting with Simultaneous Previews: A River Plot Interface for Time Series Forecasting. Proceedings of the International Conference Information Visualisation (IV), IEEE Computer Society, 2007. Image courtesy of Paolo Buono. Zhao, J.; Drucker, S. M.; Fisher, D. & Brinkman, D.: TimeSlice: interactive faceted browsing of timeline data. Proceedings of the International Working Conference on Advanced Visual Interfaces (AVI), ACM, 2012. TimeSlice is an interactive faceted browsing tool (see FacetZoom) for time-oriented data, providing a flexible approach for constructing, comparing and manipulating multiple queries over faceted timelines. These queries are organized by a dynamic filtering tree structure that displays both current focused queries and their contexts (such as queries that share the same attribute on one facet but that differ on another). Tree nodes (representing attributes) and tree levels (representing facets) can be manipulated directly, which offers efficient navigation across different perspectives of the data. Card, S. K.; Suh, B.; Pendleton, B. A.; Heer, J. & Bodnar, J. W.: Time Tree: Exploring Time Changing Hierarchies. Proceedings of the IEEE Symposium on Visual Analytics Science and Technology (VAST), IEEE Computer Society, 2006. Card, S. K.; Suh, B.; Pendleton, B. A.; Heer, J. & Bodnar, J. W. (2006), © 2006 IEEE. Used with permission. Tominski, C.; Schumann, H.; Andrienko, G. & Andrienko, N.: Stacking-Based Visualization of Trajectory Attribute Data. IEEE Transactions on Visualization and Computer Graphics, Vol. 18, No. 12, 2012. The Trajectory Wall shows temporal, spatial, and attribute aspects of movement data as a hybrid 2D/3D visual representation. Starting with an appropriate grouping of movement trajectories, the trajectories are mapped to 3D bands that are stacked above a map display to erect a trajectory wall. A user-selected data attribute associated with the movement (e.g., speed, acceleration, sinuosity) is color-coded along the individual bands. Additional 2D lines are embedded directly on the map to better preserve the spatial aspect of the movement. An interactive time lens enables the user to access temporarily aggregated information about a selected spatial region of the data. While the trajectory bands focus on the spatial aspect and linear temporal character of the data, the time lens emphasizes the cyclic temporal components. In combination, the interactive visualizations enable users to explore trajectory attributes with regard to their spatial and temporal dependencies. Movement patterns such us general commuting behavior, unexpected deviations, or trends in the development of trajectory attributes can be discerned. Robertson, G.; Fernandez, R.; Fisher, D.; Lee, B. & Stasko, J.: Effectiveness of Animation in Trend Visualization. IEEE Transactions on Visualization and Computer Graphics, Vol. 14, 2008. Generated with Trendalyzer with permission of the Gapminder Foundation. Brodbeck, D. & Girardin, L.: Interactive Poster: Trend Analysis in Large Timeseries of High-Throughput Screening Data Using a Distortion-Oriented Lens with Semantic Zooming. Poster Compendium of IEEE Symposium on Information Visualization (InfoVis), IEEE Computer Society, 2003. Brodbeck, D. & Girardin, L. (2003), © 2003 IEEE. Used with permission. Kulpa, Z.: Diagrammatic Representation of Interval Space in Proving Theorems about Interval Relations. Reliable Computing, Vol. 3, No. 3, 1997. Kulpa, Z.: A Diagrammatic Approach to Investigate Interval Relations. Journal of Visual Languages and Computing, Vol. 17, No. 5, 2006. Qiang, Y.; Delafontaine, M.; Versichele, M.; De Maeyer, P. & de Weghe, N. V.: Interactive Analysis of Time Intervals in a Two-Dimensional Space. Information Visualization, Vol. 11, No. 4, 2012. Image adapted from Qiang, Y.; Delafontaine, M.; Versichele, M.; De Maeyer, P. & de Weghe, N. V. (2012). Qiang, Y.; Delafontaine, M.; Versichele, M.; De Maeyer, P. & de Weghe, N. V. (2012) popularize the original idea by Kulpa, Z. (1997) and Kulpa, Z. (2006) of visualizing time intervals using a triangular model. In this model, an interval is represented as a dot with two attached arms. The dot is placed so that the arms connect the horizontal time axis exactly at the start and the end of the represented interval. The point's height corresponds to the interval's duration, which is mapped along the vertical axis. This representation is useful in many scenarios, in particular when it comes to reason about properties and the relationships of multiple intervals. In that case, the triangular model generates easily distinguishable visual patterns for all possible interval relations. Andrienko, N. & Andrienko, G.: Interactive Visual Tools to Explore Spatio-Temporal Variation. Proceedings of the Working Conference on Advanced Visual Interfaces (AVI), ACM, 2004. Horn, W.; Popow, C. & Unterasinger, L.: Support for Fast Comprehension of ICU Data: Visualization using Metaphor Graphics. Methods of Information in Medicine, Vol. 40, No. 5, 2001. Left: Adapted from Horn, W.; Popow, C. & Unterasinger, L. (2001). Right: Image courtesy of Werner Horn. Guo, D.; Chen, J.; MacEachren, A. M. & Liao, K.: A Visualization System for Space-Time and Multivariate Patterns (VIS-STAMP). IEEE Transactions on Visualization and Computer Graphics, Vol. 12, No. 6, 2006. Generated with the VIS-STAMP system. Rind, A.; Miksch, S.; Aigner, W.; Turic, T. & Pohl, M.: VisuExplore: Gaining New Medical Insights from Visual Exploration. Proceedings of the 1st International Workshop on Interactive Systems in Healthcare (WISH@CHI2010), Dealer Analysis Group, 2010. Rind, A.; Aigner, W.; Miksch, S.; Wiltner, S.; Pohl, M.; Turic, T. & Drexler, F.: Visual Exploration of Time-Oriented Patient Data for Chronic Diseases: Design Study and Evaluation. Information Quality in e-Health, Springer, 2011. Generated with the VisuExplore software. Lin, J.; Keogh, E. J. & Lonardi, S.: Visualizing and Discovering Non-Trivial Patterns in Large Time Series Databases. Information Visualization, Vol. 4, No. 2, 2005. Lin, J.; Keogh, E. J.; Wei, L. & Lonardi, S.: Experiencing SAX: A Novel Symbolic Representation of Time Series. Data Mining and Knowledge Discovery, Vol. 15, No. 2, 2007. Forlines, C. & Wittenburg, K.: Wakame: Sense Making of Multi-Dimensional Spatial-Temporal Data. Proceedings of the International Working Conference on Advanced Visual Interfaces (AVI), ACM, 2010. Image courtesy of Clifton Forlines. Matthews, G. & Roze, M.: Worm Plots. IEEE Computer Graphics and Applications, Vol. 17, No. 6, 1997. Matthews, G. & Roze, M. (1997), © 1997 IEEE. Used with permission. This site uses jQuery and css-toggle-switch. Icons used and adapted from Icons8.